So glad to finally announce the first of our big shows for next year! THE BALLAD OF FRANK ALLEN: A BRAND NEW comedy about a man who lives in another man’s beard! From the bizarre mind of Fringe-favourite Shane Adamczak (Trampoline, Zack Adams, 3x Canadian Just For Laughs Award Nominee and producer of the Award-winning ★★★★★ Fringe hits This Is Not A Love Song and Vicious Circles) comes a brand new comedy about how even the smallest people can do big things. Featuring two of WA’s most established Indy Theatre performers; Shane Adamczak and St John Cowcher (The Red Balloon, Farm and The Adventures Of Alvin Sputnik), Weeping Spoon Productions are delighted for their latest work to make it’s world debut as part of the 2016 Fringe World Festival. We’re super excited to announce that the show will also be touring to The Adelaide Fringe and to Canada for the Edmonton International Fringe Theatre Festival and Vancouver Fringe Festivals in 2016! Secondly, following a successful 2015 Canadian Tour, our award-winning fringe show TRAMPOLINE returns once again to make it’s Adelaide Fringe Festival debut. A Boy meets girl story that’s less than ordinary. 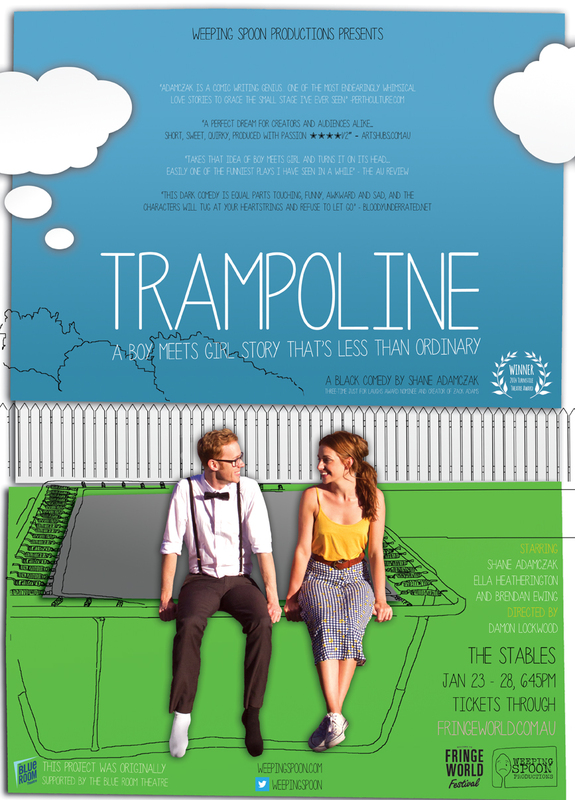 TRAMPOLINE is a feel-good comedy that will warm your heart, make you laugh and make you question the very notion of normal! It’s going to be a big year here at Weeping Spoon HQ, and this is just the beginning! Meet the 2016 Weeping Spoon Team! We are so incredible excited to finally announce the new Weeping Spoon Productions Team! Huzzah for awesome new Australian indy theatre! The new team will usher in a stellar 2016 season including a remount of the critically acclaimed fringe-hit TRAMPOLINE as well the world-debut of two new international touring works that will be announced very soon! From the mind of Shane Adamczak (Zack Adams, 3 x Just For Laughs Award Nominee and producer of recent ★★★★★Fringe hits This Is Not A Love Song and Vicious Circles) comes a boy meets girl story that’s less than ordinary. Weeping Spoon enter the second half of our epic 2015 season by bringing our hit comedy Trampoline on a 2 month, 3 city tour of the Canadian Fringe Festival circuit. The show will be playing at The Winnipeg Fringe, Edmonton Fringe and Victoria Fringe Festivals. Joining original cast member Shane Adamczak and Director Damon Lockwood will be our new leading lady Whitney Richards, who we are delighted to have working with us for her first ever International Fringe Tour. Rounding out the touring cast are Fringe favourites Patrick Hercamp and Richard Maritzer from LA Troupe Sound & Fury (playing the third performer roles in alternate cities). Following the success of our previous shows Love Songs For Future Girl, A Complete History Of Zack Adams and Zack To The Future in Canada, Weeping Spoon is thrilled to be returning the Canadian Fringe circuit with our latest work, Trampoline. Follow us on Facebook and Twitter for tour updates and for more Weeping Spoon news. We’re proud to announce the second of our big three shows for this Fringe World. Weeping Spoon’s own Wyatt Nixon-Lloyd (Nickelodeon, Funny Or Die) teams up with The Big HOO-HAA’s Bri Williams to bring you the improvised comedy adventure BRI AND WYATT SAVE THE WORLD! There’s a lot of bad news out there today. Environmental disasters, an all time high unemployment rate, Red Foo. The world needs a hero. No, heroes. Two people who between them both, truly believe that they can save the world. Enter Brianna Williams and Wyatt Nixon-Lloyd: improvisers, life enthusiasts and would-be-heroes. 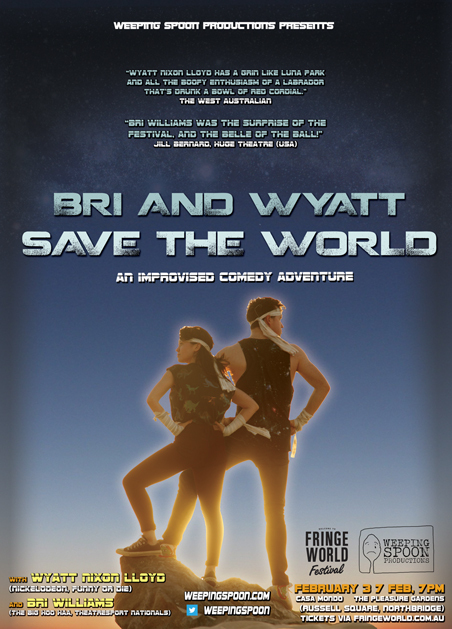 They may not be able to save the world, but their hope is that the premiere of the improvised duo show “Bri and Wyatt Save the World” will bring a smile to the face and a laugh to the belly of the general Perth audience. Armed only with your ideas and their wits, in sixty minutes of improvised comedy, Bri and Wyatt are going to save the world. The program is finally revealed so we can finally start telling you about our awesome Fringe World shows for 2015! We are thrilled to be remounting our award-winning show TRAMPOLINE with a brilliant new cast including the extraordinarily talented Ella Hetherington, Brendan Ewing and Shane Adamczak. The had a great sell-out run in Perth followed by a debut Canadian season in Montreal, received rave reviews and a Turnstile Award for independent theatre in WA. The show is playing for ONE WEEK only so be sure to book ahead to avoid missing out. As the company prepares to launch into it’s 2015 season, we are excited to announce our new Artistic Director Shane Adamczak. 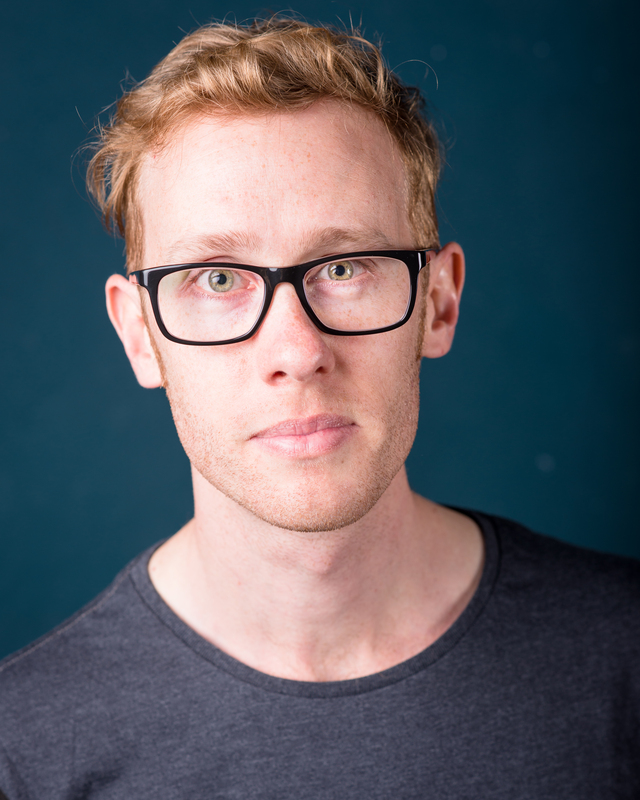 As a founding member of Weeping Spoon, Shane has produced a number of the company’s National and International touring productions including Love Songs For Future Girl, Checkout The Musical and most recently the award-winning fringe hits Vicious Circles and Trampoline. As AD, he will be spearheading a number of the 2015 touring productions as well as focusing on the future of the company both in Australia and overseas.